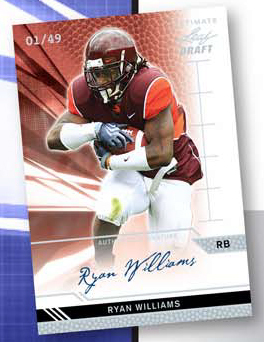 Leaf returns for a 2nd round of draft themed football cards this May. The follow-up to the successful 2011 Leaf Metal Draft will add die-cut helmet and football autographs to the mix. Each hobby box of 2011 Leaf Ultimate Draft delivers 4 on-card autographs featuring names like Newton, Gabbert and Green. 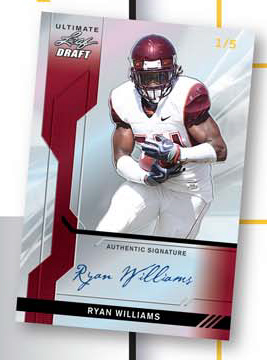 Leaf's inaugural season in the NFL draft market ends with a bang with the follow-up to popular 2011 Leaf Metal Draft, which also delivers 4 autographed cards per box. Checklist features 70 of the biggest names from the 2011 NFL Draft with an emphasis on offensive skill players (QB, HB, WR). 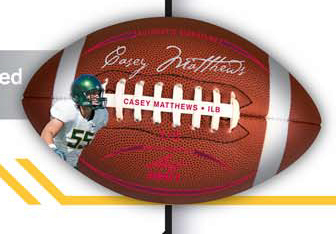 Look for autographed cards featuring Blaine Gabbert, Cam Newton, Mark Ingram, Julio Jones, A.J. Green, Jake Locker, Ricky Stanzi, Ryan Williams and other big name skill players. Every card in the product features a hard signed on-card autograph. Each pack will contain: 1 Base Ultimate Autograph, 1 Metal Premium Autograph (ultra-thick version of Metal stock), 1 Die-Cut Helmet Autograph, 1 Die-Cut Football Autograph. Base autographs #'d to 49 with the possibility of pulling a parallel #'d to 20, 5 and 1.